In surah al Fatiha Allah teaches us what to ask. On our behalf, he asks a question which he (swt) then answers himself. He did not leave it on our shoulders to coin the question. If it was left on our shoulders, most would have asked to have dunya, spiritual status, fame and name etc. We learn that Allah asks guidance for us, in sura Al Fatiha and not anything else.. This is the greatest blessing for us and the most important thing for us. – He chose the question for us and also answered it for us. – Guidance is not only about the right and wrongs or relating to the affairs of the hereafter. But it also covers the worldly accepts as well. Like how to walk, eat, do business etc. The rest of the Quran is the answer and elaboration of the answer. Posed in in sura Al Fatiha. – To learn from the fountain of Al Quran and Allah. One has to begin by submitting himself to Allah. To admit ‘I don’t know anything’. To profess ones inability to know anything. This is why we find Sura Bakarah begins with Allah saying (ALIF, LAM, MEEM) no one knows the knowledge of these first few letters save only those who Allah wants. – Mutaqeen are those people who want to save themselves from the hellfire. 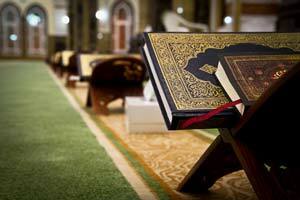 The Quran will not open it’s guidance unless a person is from the mutaqeen. – A person who wants to change. The complete Quran from the beginning to end, is a dawah. It is up to us wether we accept or not. A person who is a mutaqi is like a person who has put the his car to the first gear and the car is about to move. You cannot be a person sitting in neutral gear and expect to go anywhere. – the want to change has to be there. – Jannah has several doors and within one station of paradise there are several levels of the same paradise. For example; Jannahtul Firdous is like a country and the darus Salam (a level of paradise within Jannahtul Firdous) is the capital of the country. There are 8 levels of paradise but within each station, there are different levels of each of paradise. For instance; Jannahtul Firdous will have level 1,2,3 …. The higher the better quality of Jannah. Similarly, each 8 paradises have their own levels. – Imam Ahmad Mubarak says when he sat with Syyiduna Abdul Aeez Dabbagh he was surprised to see how it felt as though Syyiduna Abdul Azeez Dabbagh was sitting & living with the prophets and the previous awliyah. Such was the vividness of the stories and narrations he would relate. – Taqwa is to restrain your desire when there is attraction to any sin. There is no greatness to a person who says ‘Now that i have become religious, I am switched off from the attraction of women’. (This does not mean one can look for avenues of sin and expect to come out clean). It means to not come up with your own understanding of what Taqwa is. – A saying: ‘To see how a person is managing his worldly affairs look at his stomach. If he has unnecessary fat or big stomach then know his affairs of the world are also like this. Messed up and not in a smooth state’. The stomach is a small dunya. If we cannot manage to govern our little dunya properly, how can we govern the bigger world? – A person who leaves behind a lawful action in fear that it may lead to an unlawful act is a very blessed individual. Like Syyiduna Umar (R) who would abstain from many lawful actions in fear it would lead to unlawful actions. – A heart which is “Kable-Salim” is a heart which locks the love of Allah in and no drop of it escapes it. Previous PostHow to have the access to the mercy of the prophet (saw)Next PostThe Crescent & Star symbols of Islam?